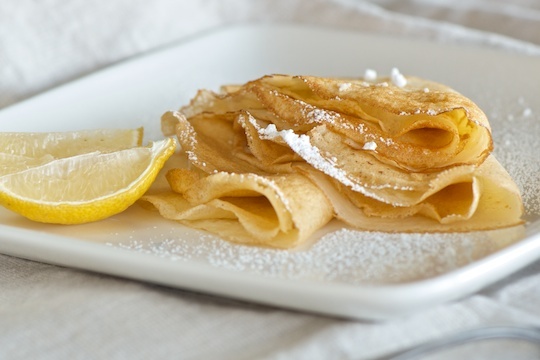 Next Tuesday, February 28th, is Shrove Tuesday, traditionally known as ‘pancake day’ in the UK. 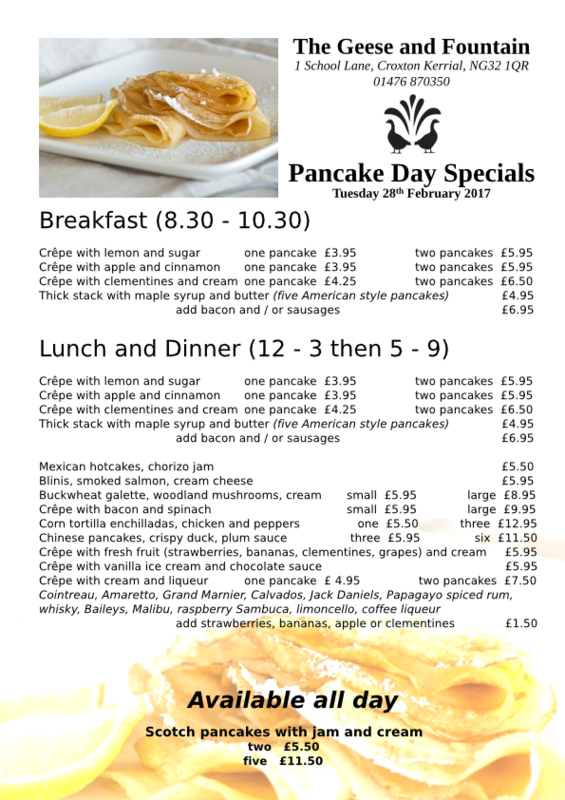 We’ll be celebrating with a menu of pancakes and pancake-related specials all day, from breakfasts of maple syrup and bacon on a stack of American style pancakes, to a dinner of buckwheat galettes with mushrooms, or tortilla enchiladas, followed by crepes with your choice of liqueurs or ice cream, fresh fruit or chocolate sauce. 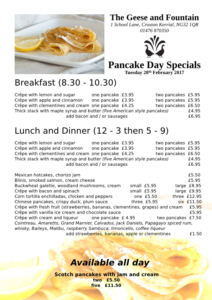 Tables can be booked for lunch or dinner, with dinner service starting early from 5pm, so that our pancake day extravaganza can be especially family friendly. Book now by calling 01476 870350. We’re thrilled to announce that the Geese and Fountain is now recommended by the Great Food Club. The GFC is an excellent initiative, which began in Leicestershire but now covers many other parts of the UK, supporting and promoting independent producers and outlets that represent the best of their local area. Whether it’s food, wine, a night out or a night in you’re after, the GFC are sure to have recommendations that will fit the bill. And lots of their recommended businesses offer exclusive deals or discounts to GFC members. We certainly do. Any Great Food Club member eating at the Geese and Fountain can claim a 10% discount on their food bill – because we wan to say ‘thank you’ to customers who put local quality first. We’d encourage all our customers to check out the Great Food Club, and join up if you’re not already a member. The Geese and Fountain are delighted to announce a sponsorship arrangement for the coming season with our local cricket team, the Croxton Kerrial Cricket Club. Starting with the 2017 season, the Geese and Fountain will provide the match balls used in all Croxton Kerrial’s home games. We’d like to encourage all our friends and customers to join us in wishing the team a very successful summer. Their fixture list is on the club website. If you’re planning on visiting the Geese and Fountain for Sunday lunch this summer, why not combine it with an afternoon watching some village cricket? Anyone interested in joining the Cricket Club should note that they are now holding winter nets on Monday evenings between 8.30 and 9.30 at the Mark Fell cricket centre in Grantham. Contact them via their website if you’d like to get involved.